When you order dinner at Duner’s, the server will ask what kind of dressing you want with your salad. Throw in a basket of warm, yeasty bread wrapped in a cloth napkin, huge portions of rich food, and servers who remember you name, and you start to get the picture. This is an old school restaurant, the type of place you can take the parents and grandparents. Opened in 1983, it remains a Charlottesville institution, where lines out the door are the norm, especially on weekends. 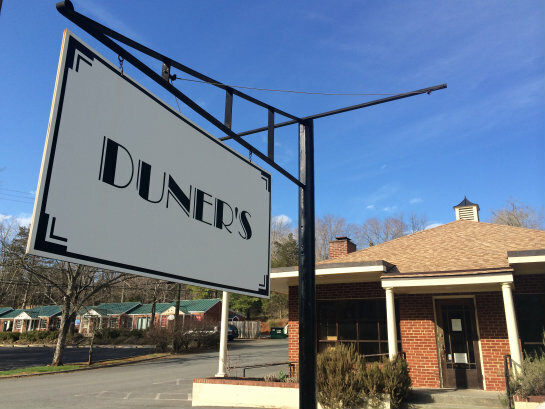 What makes Duner’s worthy of The Charlottesville 29, though, is not its history or even the friendly service, but rather the food. Owner Bob Caldwell, who started as a Duner’s cook himself, has a knack for hiring chefs. Currently leading the kitchen is talented chef Laura Fonner with support from CIA-trained pastry chef Linda Steiner, whose desserts have been known to warrant drives across town. The menu changes literally every day at Duner’s, and is conveniently posted online. Given the frequent changes, specific dish recommendations may be less helpful than suggested categories. Below is a list of our suggestions, the chef’s own favorites, and appearances in Five Finds on Friday, where a local chef or personality has named a Duner’s dish as one of the best in town.